there is a new key tourism=apartment. Which is similar to tourism=chalet, but likely to be in more crowded areas. I suggest to render it with the same symbol as tourism=chalet, but starting at lower zoom-level. I think that it would be overkill. Such features are not too important and in some areas it would result in a really bad rendering - there are towns where nearly every house rent apartments. airbnb and similar are making situation significantly worse for such rendering. I propose closing this request. I still find the low usage (2.8k) is a concern. I also don't find it as relevant as other tourism features for a general purpose map. A large part of this is relative insignificance on the ground. I doubt you could see any of these if you were there in person. They'd be unsigned, even inside the building. The current usage of tourism=apartment is relatively low, because mappers are massively inclined to use descriptive names and misuse tourism=chalet instead to get holiday apartments rendered. 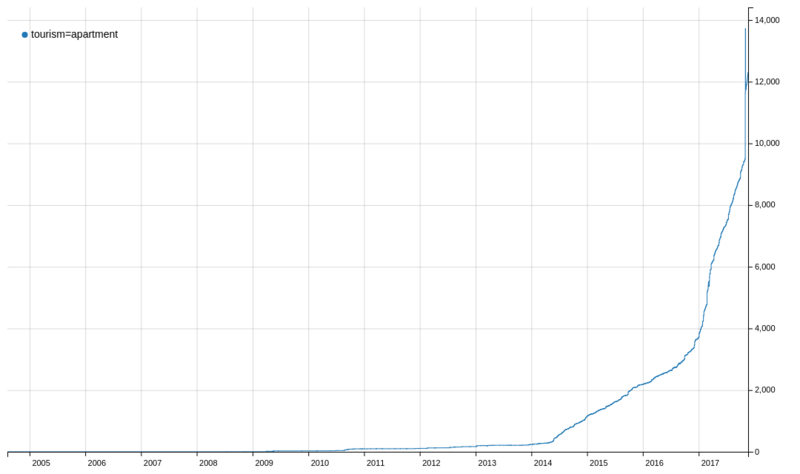 The number of the actually existing tourism=apartment are significantly higher than the low usage might imply on first sight. And to my experience they are almost always visible on spot due to outdoor advertising. I would suggest to render tourism=apartment with the same symbol as tourism=chalet, but starting at a lower zoom-level. I still find the low usage (2.8k) is a concern. Yes, this type of accommodation are also popular e.g. in Croatian places along the seashore, where every other house may rent some apartments (even most of a house may be designated for apartment rentals). They often have names (of the house/villa) and outdoor advertising, so they are visible on the spot. Rendering them would be useful. I suggest to render it with the same symbol as tourism=chalet, but starting at lower zoom-level. I like this suggestion - what about z18 for example? @kocio-pl z18 would be fine! I stayed at a tourism=apartment this SOTM, and I still believe it is something we shouldn't render. The visibility on the ground is very limited, so it doesn't help you with orientation. A specific apartment is unlikely to be a feature you are going to in an area because they have limited size. There are nowadays a lot of "invisible" tourist apartments (airbnb, booking etc), and there are apartments with hotel-like signage (i.e. very prominent, especially in remote areas they might be the most significant feature), sometimes even offered by actual hotels (the latter case is not interesting either, because we would already show the hotel). After reviewing the additional discussion I think the original decision to decline remains the right one. @pnorman could you please reiterate what the original decision was actually based on? In my opinion, I think that most (or all?) of the early arguments against rendering these objects have been falsified: For example the low usage numbers (see updated graph in #401 (comment)). 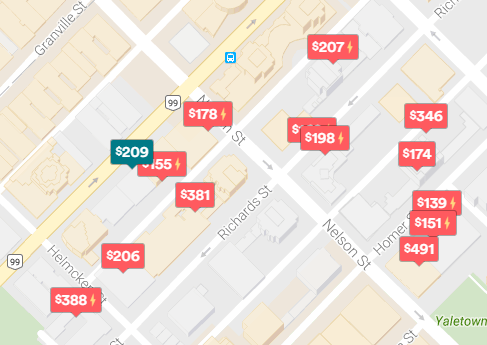 As far as I can see, the tourism=apartment tag is currently not really used to map airbnb-style apartments, but much more often for "serious" tourism businesses (which typically do have a name/sign on the building, own websites, proper contact information, etc.). 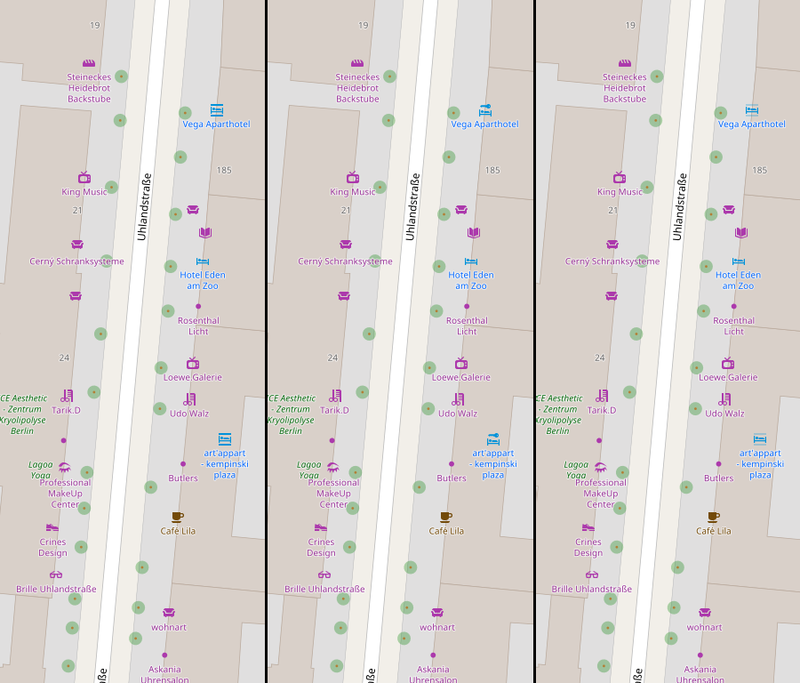 Actually, I think that it would not even make sense to map unsigned (even inside the building) apartments-for-rent, because that would simply be against OSM's on-the-ground verifiability rule!? 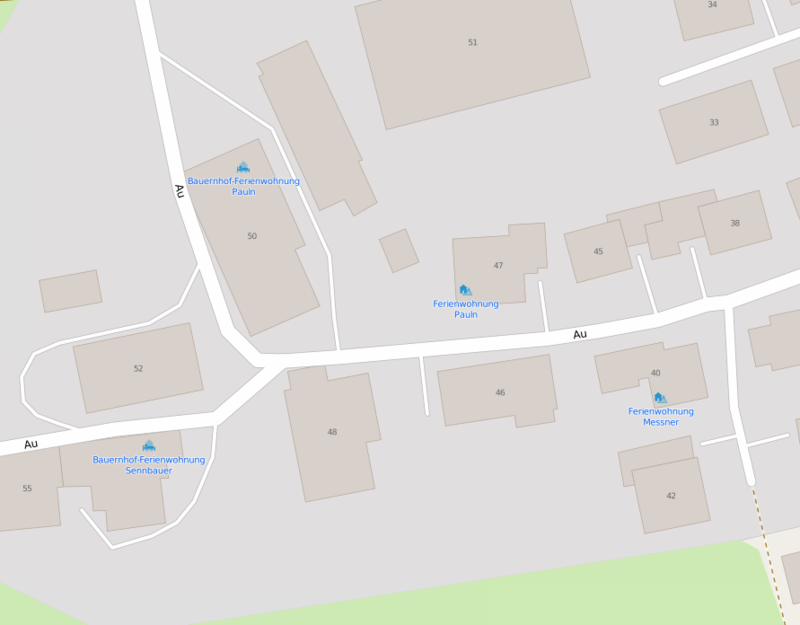 I find the current situation very annoying where people continue to actively misuse other tags such as tourism=guest_house to map this kind of tourism businesses (because the proper tag is not rendered on the map). On 5 Mar 2017, at 18:26, Martin Raifer ***@***. ***> wrote: Actually, I think that it would not even make sense to map unsigned (even inside the building) apartments-for-rent, because that would simply be against OSM's on-the-ground rule!? I'm not sure if it makes sense to map them, but it wouldn't be against the on the ground rule, as long as there are tourist apartments, signed or not. …but if it's not signed, you cannot find out if there actually is a tourism apartment or not (except for checking on the airbnb website which is of course no viable source for OSM). One mapper might have stayed at such an "invisible" apartment, but others cannot verify it on the ground -> ergo it should not be mapped. Isn't that one of the basic working rules for mapping? 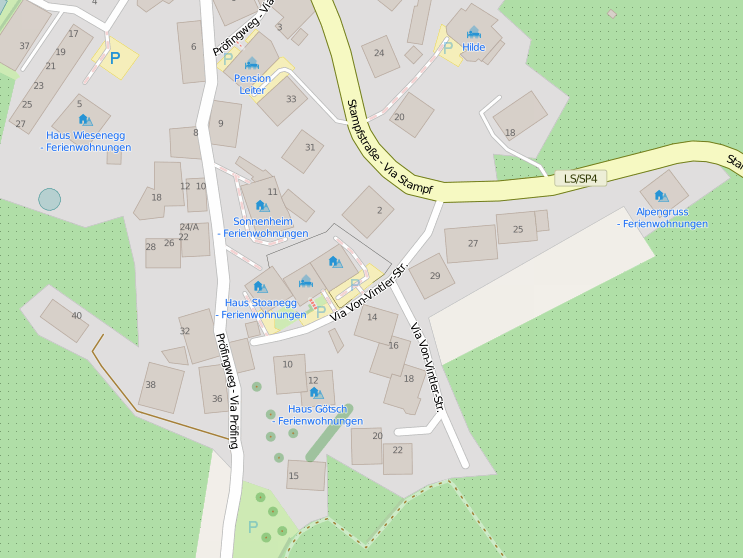 Contributions to OpenStreetmap should be: […] Verifiable - means that others can go there and see for themselves if your data is correct. +1 According to taginfo by today there are 5.4 k occurrences in the db. Both of the main editors (iD and JOSM) provide presets for tourism=apartment. So I would deeply like to ask for rendering! On 5 Mar 2017, at 19:05, Martin Raifer ***@***. ***> wrote: …but if it's not signed, you cannot find out if there is actually a tourism apartment or not (except for checking on the airbnb website which is of course no viable source for OSM). One mapper might have stayed at such an "invisible" apartment, but others cannot verify it on the ground -> ergo it should not be mapped. Isn't that one of the basic working rules for mapping? So the JOSM icon is: which is hard to recognise. What about my proposal with the two grey lines ? Not fully self-explanatory, but neither are chalet nor guest house. Thanks, didn't know this! You're right, JOSM was used just as a proof that somebody else thought about using part of the building too. If window in the background won't work, rendering guest house would be still preferable for me (with z18+ instead of z17+), because this would give us a benefit of "similar but smaller" association. BTW: your design reminds me that we could make hospital to be more neutral - mirrored red bed in the circle might work. @geowOSM - Sarcasm does not help to solve the issue. Sorry, it's not meant sarcastic or arrogant, but there is a serious point. Apparently the participants in this thread are not graphic designers. My intention was to suggest that we seek some assistance from outside. I'd be not happy with the same icon for guest house and apartment, since the service concept is different. In the guest house you typically get breakfast and room service (just not full hotel attendance), while in the apartment you are on your own once you get the key. Hm, key... what about a bed and a grey key in the background? I'd be not happy with the same icon for guest house and apartment, since the service concept is different. Sure, it's my second choice exactly because they are not the same. However they are similar and if we have no better idea, making a difference by zoom level is still enough for me. Yes, that sounds good to me! We would still have house vs room (house vs key) analogy plus we already have a small key element tested and used (bicycle station for example - "renting a bed" also sounds like plausible analogy 😄), so designing this icon should be easy. My intention was to suggest that we seek some assistance from outside. AFAIK we asked some time ago on mailing list and nobody was interested. If somebody has a good how to encourage people to contribute icons it can be done (or discussed in a separate issue if it involves some changes to a project). Added the bicycle key to the drafts above (4) - my favourite so far. The SVGs are in my gist. Thanks, 4 is exactly what I have envisioned for z18+! Could you prepare a PR with it? If you agree I would like to submit the topic for the next weeklyOSM. Good idea, it is better than posting to mailing list (that feels spammy for me to keep doing it again and again) and there is chance that somebody relevant will read it. In general any feedback is useful (except "why it is not yet implemented" comments or people posting "+1" instead of using reaction feature). I guess we need both icon designers and code newbies (osm-carto is specific project, so even if one knows SQL and git, there's still CartoCSS, cartographic POV and local conventions). There are tons of issues that can be fixed with a little guidance from maintainers mainly by extending/fixing current code, but even small feature takes some time and focus usually and I can't handle more than few of them at once, for example. Unfortunately there was no response from new people when I asked lately on Talk list if anyone is willing to join us and learn the basics. So we're still looking. Should do, probably, so the skills don't get rusty. Does it make sense to create a new directory under symbols to tidy up? There is shop already, so we could either use tourism or more specifically accommodation? I guess tidying should be separate (and simple) ticket. On 12. Jan 2018, at 04:01, polarbearing ***@***. ***> wrote: What about my proposal with the two grey lines ? Not fully self-explanatory, but neither are chalet nor guest house. Got feedback, it's scheduled for the next edition (391). 4, hotel bed with key from rental_bicycle (mirrored) ? I spent last night setting up docker/kosmtik, was expecting this a bit more lightweight than it comes. For me the key in 4 is too vague/unspecific as most forms of accommodation provide you a key. I like the "bed with two grey lines" for its simplicity, resembling a room or flat. On 13. Jan 2018, at 12:42, polarbearing ***@***. ***> wrote: two grey lines or 4, hotel bed with key from rental_bicycle (mirrored) ? Key version is more readable for me. Thanks all for following up this ticket, for new fresh ideas and for nice preview picture. Yes the reasons you name for the key version were what I thought as well. Anyway there were more votes for the box version, which also symbolises the situation well, thus why I made the PR with that icon. @kocio-pl - anything else to do? Since PR is ready, somebody needs to look at the code and test it, so now it's work for repo maintainers.